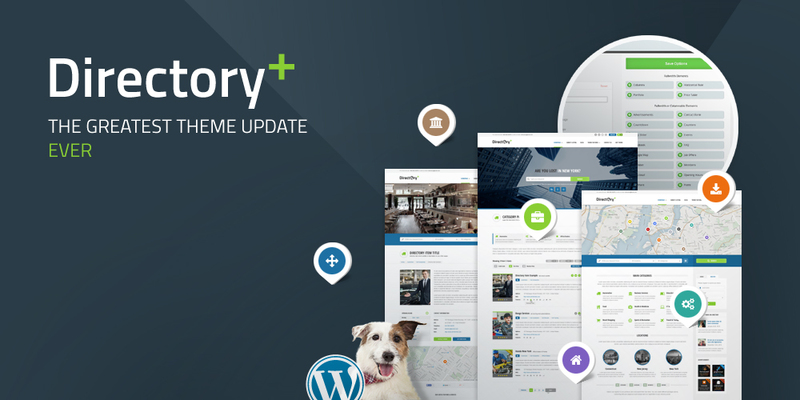 It’s been quite time since we started creating themes for Themeforest community. We’ve just passed amazing 2000 days and during this long time we’ve released thousands of updates to all our WordPress themes. During these 5 years we’ve also invented many new and unique features and themes. One of them was also Directory WordPress theme. This unique theme, the very first one on themeforest have opened doors to online business to almost 10.000 people. It’s not a generic theme like any other, it’s a tool that will power your entire online business and allows you to achieve passive income. We’re very proud that we were the very first ones with this theme concept. We were listening to our customers and created very unusual theme update. We could release Directory+ theme as a brand new theme, completely separated from the old one. Directory+ package includes several years of hard work of the whole AIT team. Our idea is to support each other and therefore all our existing Directory customers can migrate their Directory powered websites to the brand new Directory+ theme for free. In order to be able to provide support and updates also in the future we need support from your side. 18 new features such as Fully responsive design, AIT Page Builder, Video Header, Miles/Km support, etc. Great futuristic features like 3D Map and Business View. Featured item listings and Colorized google maps. Compatibility with AIT Languages multilingual plugin where for the price of 1 plugin you’ll get not only multilingual support but also language translations. These translations are continuously added and updated by translation professionals. Every project is different and has different needs. Not everyone needs multilingual support, payment gateways or bulk data import. We’ve separated these features and created individual plugins. We’re also working on new directory portal oriented WordPress themes with new unique look and features. Did you know that license for all our products on www.ait-themes.club is for unlimited websites and usage? 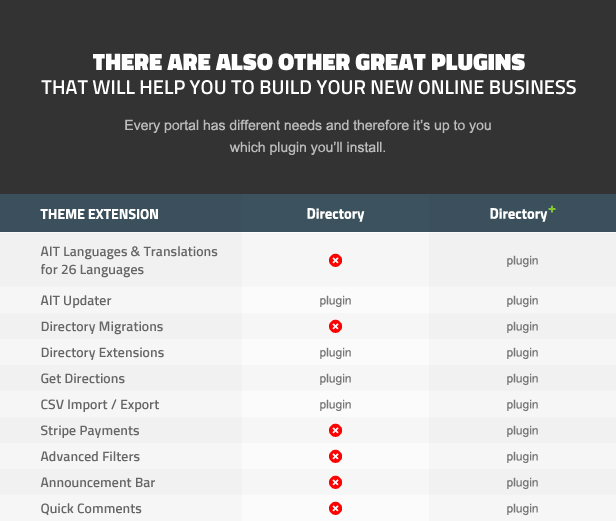 You can use all plugins not only with our Directory+ and City Guide WordPress theme, but also with themes that are currently under development. Directory+ theme is built on our AIT Framework 2 which is continuously developed since 2012. Whole philosophy is built on wide range of settings, page builder and multilingual support. We’ve created a tool to create almost any website. 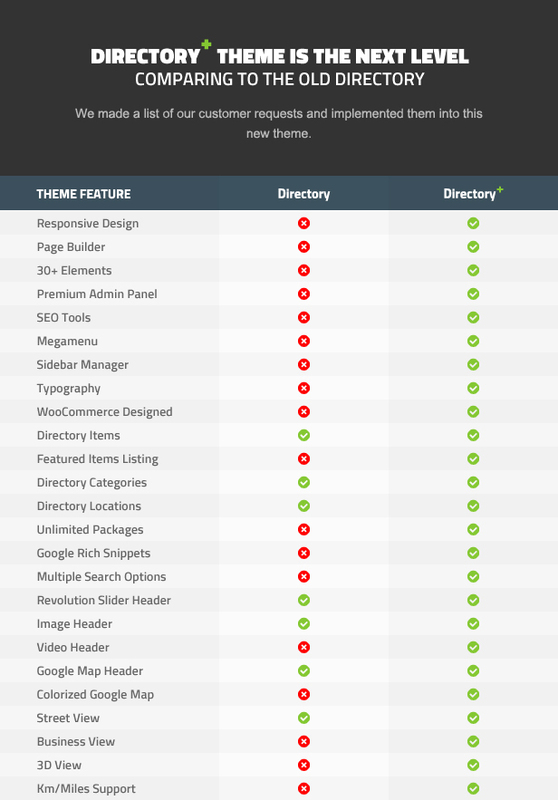 Directory+ theme is fully loaded multi-purpose theme you can use for any kind of website. What are advantages of plugins? 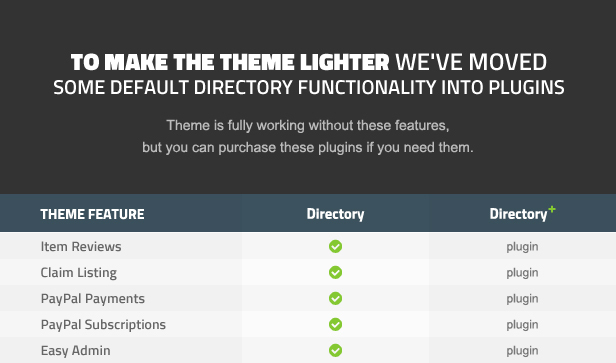 Plugins are and will be compatible with all our new directory portal oriented themes. We currently have 2 portal themes, but we will be releasing new ones on upcoming months. There’s unlimited website and project usage. 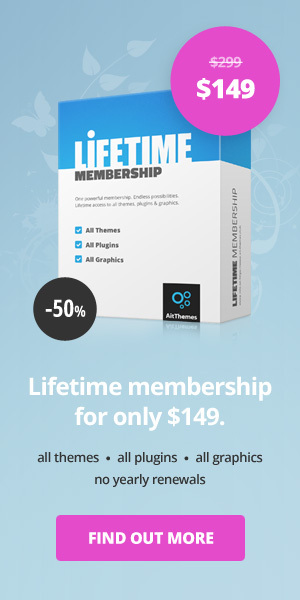 You’ll buy the plugin once and use it on unlimited projects. Premium Membership is our biggest package for the best price you can find. Get access to all our products on www.ait-themes.club for only $89. Why is it great to become Premium Member? With the help of AIT Migration plugin that you can download for free you can migrate your data from Directory to Directory+ theme in a couple of clicks. As Directory+ is built on a completely different framework, it’s important to set up all your directory packages, PayPal credentials or other settings like colors, logo or header settings. It’s important to follow steps from the documentation in order to migrate your data correctly from the old custom post type to the new one. I received your e-mail about the Directory plus update. When I try to sign in to get the migration plugin it won’t take my User ID and Password. I can get into the Envato site. I downloaded the new Directory Plus update, but I can’t get the migration plugin. Can you help? I’ve bought 3 copies of the Directory theme and would like to update all three. Envato username&password won’t work on our site. I have to say I don’t feel very confident trying to move over a live site from the old Directory to the new Directory+. Is it possible for someone who’s professional to do this for a fee? thanks for your question. We do not offer this service due to capacity reason. Thanks for understanding. I got a message that said I could download the Directory theme free… but I dont see how. in case that you are an owner of Directory theme from Themeforest, you must login into your account and download it. I received your e-mail about the Directory plus update. When i sign in to themeforest and go to theme page. It’s not free! Hi, thanks for interesting in one of our products. It’s free update that regards to current owners of previous theme version. If you have bought the theme before, you can download the latest version for free. Please confirm that if I buy this service you will update my current website (Directory) with Directory+ and it will be totally updated with all the existing items, content, images, header logo etc. I emailed a couple of days ago, but didn’t receive a reply. I really want to get going on this. thanks for your message. We unfortunately do not offer that service due to capacity reasons. Thanks for understanding. Our support team is ready to assist you with any kind of issue regarding the theme. Customization is not included. Have a nice day! Can I update to Directory+ for free? Or Can I Refund Request My money ? Hi, I purchased the FINDER theme, as the banner on that page stated we could upgrade or swap anytime to Directory when the new + version was out, or that is what I thought it meant so I chose that theme thinking I can always upgrade. Hi, I am interested in Directory+ but have limited knowledge of WordPress, is it easy to install and set-up? If I manage to set it up is it straightforward to create my website or will I require an understanding of coding etc? I want to be able to create a wedding website which has information pages and visitors can search for suppliers. I’d like the suppliers to be able to have text and images on their listing and the ability to register and upload this themselves but Admin would retain overall control. I would also like to allow visitors to write reviews of suppliers with Admin monitoring comments prior to publication. Finally I want to be able to advertise events on here and have visitors register their attendance. After reading the spec I believe this theme can do all this for me but I’m concerned how easy or complicated it will be to achieve this for someone with a limited knowledge of such things! Anyhow, after purchase theme you get access to support forum where our AIT support team will answer all your questions and help you to solve any issue regarding theme. Please kindly note, customization of the theme or plugin is not provided due to capacity reasons. Have a great day! Zlatko. the demo login into admin is not available. We are sorry for that. So do I update to directory+ and then run the migration tool? or the other way around? yes, feel free to follow our documentation at: https://www.ait-themes.club/documentation/ or simply contact us at support forum. I have the old directory theme and I updated the version Updated Directory2-Themeforest-1.8 after this update my look and feel all changed. Do i now use the migration tool plugin? I am very confused as I don’t know how to install the migration Directory to update my theme. Please help. thanks for your message. Please kindly contact our support forum, or try to read more info about free migration plugin at: https://www.ait-themes.club/biggest-update-ever-directory-wordpress-theme/ Hope this will help. I have purchase Premium Membership, but I could not located Directory+ theme. Please advise. I started a new project using the Directory + theme. It’s wonderful what I can do with it. I meet some limitations to achieve my project with + Directory. It’s not a matter of plug-ins or personal edit modifications, but the user approach (user friendly). I really think I have potential solutions for improvements of your Directory+ theme. Who can I contact to submit my ideas. thanks for your compliments. Feel free to post your idea on our support forum or here. We appreciate any kind of feedback. Hello, I’m interested in the Directory+ theme and some other options so I want to take the Premium Membership. The business finder theme has an option “delightful special offers” is this also available in the Directory+ theme? The business finder and Directory+ themes are not listed on AitThemes.club but I presume the are also available in the Premium Membership ? For my project its important that the business can list themselves on the site, and depending on the membership one of the options is to post special offers / deals. So I want to make sure thats posible. Business Finder and Directory+ – both are sold exclusively only on themeforest market place, therefore themes are not included in our Premium package. Instead of theme there are City Guide and Event Guide directory themes. I am sorry but we do not offer any additional services related to websites of themes users. General support cover mainly finding of solutions for problems in theme and help users use the product, unfortunately we are not capable working on users custom websites. Unfortunately your newest version City Guide theme is not compatible with our hosting server and a bad update has really screwed up our online business. You should check the usage problems on the City Guide theme and the plugins because it stops loading the wp login and users can’t access wp dashboard. How do unhappy customers get a refund on the theme purchase? kindly post your theme-regarding question at our support forum https://system.ait-themes.club/ which will enable answer you to most efficiently. You must have registered the product’s purchase code /in the section My Account -> Subscription/. I bought the Direktory+ theme, but support have expired since 1.5.2016. I find update, but when I try to run it show me the error “An error occurred while updating Directory Plus: Could not create directory. Directory2 / design / js / livs”. This is is because ends the sypport and don;t let me to make update ? or other prblem with WP ?. When I buy support from AIT, the problem will be solved ?. The geolocation on the site.As soon as you start to look for objects that are in the area, the browser says “Confirm action on the prohibition of geolocation”. What could be the problem? is $199 still there as i could not find this pricing plan. What i see is $299. GoDaddy advised that 5.6 PHP My SQL extension is not working well with the 4.7 WordPress. I contacted them because all of a sudden my website turned extremely slow. Please help! Anyhow, in my opinion php version 7 might help you.